If you want to dine on delicious Thai food served in a traditional open-sided pavilion (‘sala’), the Charm Thai Restaurant is perfect. Thai Chef Wisuth oversees one of Phuket’s best breakfast spreads, leisurely lunches and superb dinners. You’ll be able to sample dishes such as mixed satay, crab spring rolls, white snapper with sweet and sour sauce, and squid with garlic and pepper. This restaurant is in the Busakorn Wing. 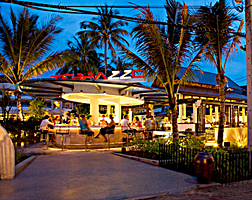 In the Main Wing is the Terazzo Ristorante, serving evening meals of great authentic Italian food. Amongst the dishes are fresh pasta, wood-fired pizza, plus seafood and meat specialities. Meat lovers will be delighted by Sam’s Steaks and Grills, serving excellent steaks of the best US and Australian beef every evening. Smart casual in style, you can dine here till midnight. The Sea Breeze Café and Terrace is open from early in the morning and is the destination for Western and Asian favourites, served buffet-style from the open kitchen. Eat inside or out on the terrace. There is a choice of evening buffets through the week, with choices like ‘family fun’, ‘surf and turf’, ‘globetrotter’ or ‘seafood’. If you fancy a pre-dinner drink or nightcap, The Bar will slake your thirst. It comes complete with live entertainment every night.